Screen greats Lauren Bacall and Christopher Plummer costar in this newest Madeline adventure. 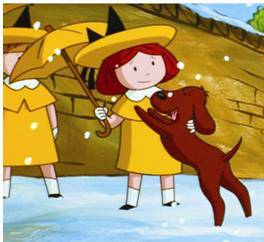 Join the 12 little girls in their house in Paris as Madeline's uncle comes to claim her. Madeline is taken on quite an adventure, with the other girls and all your favorite characters from the books there for her as always. This delightful animated movie is a great addition to your family film collection. Ashley loves the Madeline stories, so this movie was of course a hit! The animation is beautiful, the songs are great, and it is just done really well. The addition of such amazing voice talent makes this cute movie even more entertaining. Our family gives it two thumbs up! You can check it out yourself over at Shout!Factory. It's available now!